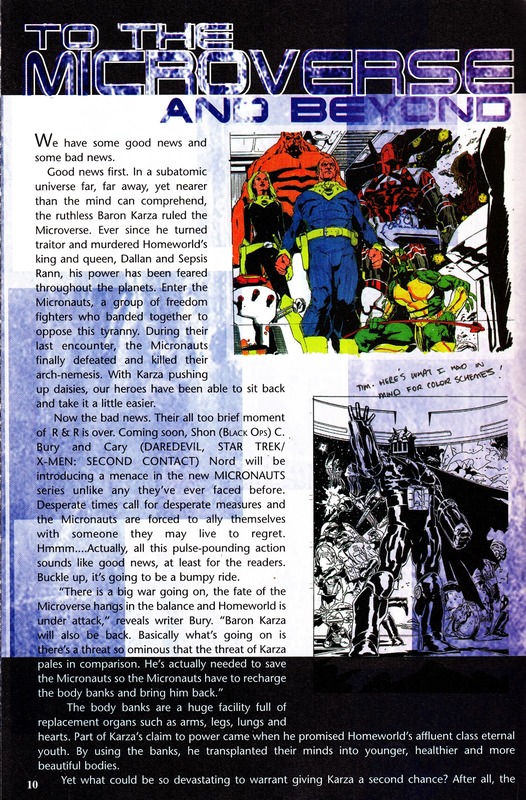 I was flicking through this copy of MARVEL VISION at the weekend, and found this interesting preview for an upcoming Marvel series which surely should be filed under (to borrow from the rather brilliant BACK ISSUE magazine) "Greatest Stories Never Told": The return of the MICRONAUTS. Marvel must have been pretty confident that this Mego revival was going to happen but - for whatever reason - it never did (Image Comics, followed by Devil's Due, finally had a punt beginning in 2002). What we see here is - ahem - pretty sketchy which suggests that things hadn't progressed much beyond the development and pitch stage. There's no sign of any completed interior pages or even a finished cover for promotional and solicitation purposes. A lot more detail on the failed revival can be found here. Marvel's original MICRONAUTS ran for 59 issues (1979-84) and two annuals. 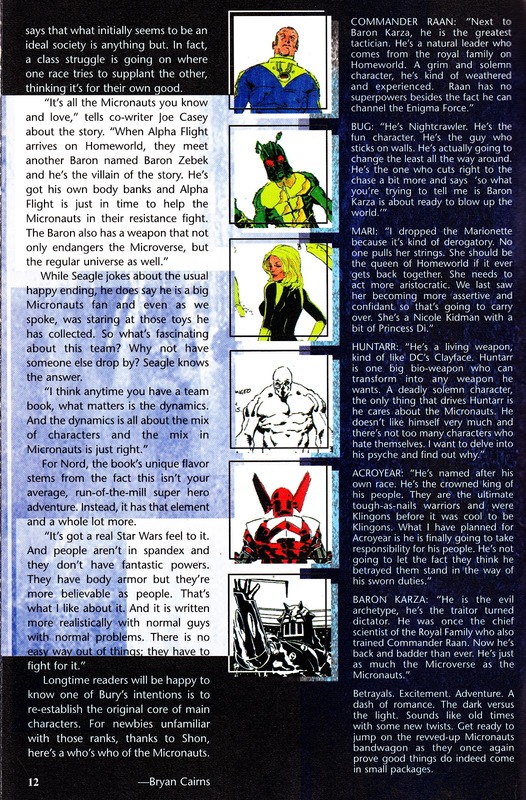 The relaunched MICRONAUTS: THE NEW VOYAGES (1984-86) immediately followed and clocked-up another 20 issues. In 1983, Marvel launched the deluxe format (lovely paper and printing) MICRONAUTS SPECIAL EDITION (5 issues) that reprinted the early issues. 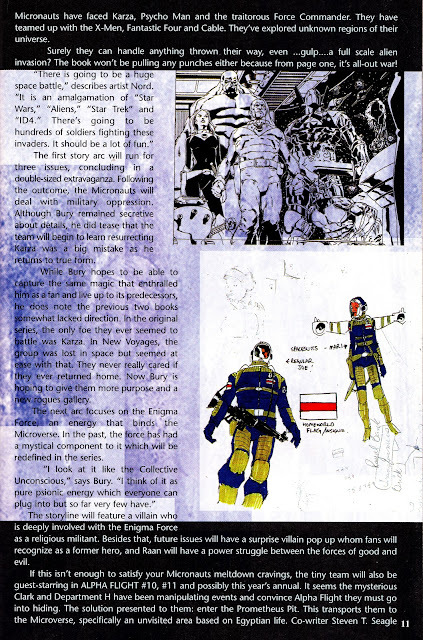 As mentioned in previous posts, the diminutive warriors made their UK debut in the pages of STAR WARS WEEKLY. They then appeared, alongside BATTLESTAR GALACTICA, in STAR HEROES WINTER SPECIAL (1979) before becoming a regular fixture, again with Battlestar, in STAR HEROES POCKET BOOK from the following summer. When that became X-MEN POCKET BOOK, they transferred to FUTURE TENSE weekly (later monthly). Their final Marvel UK appearance was the reprint of the X-MEN/ MICRONAUTS Limited Series in the pages of the revived THE MIGHTY WORLD OF MARVEL. MARVEL VISION was Marvel New York's successor to MARVEL AGE MAGAZINE and, once again, served as Marvel's in-house fanzine/ purveyor of puff-pieces. 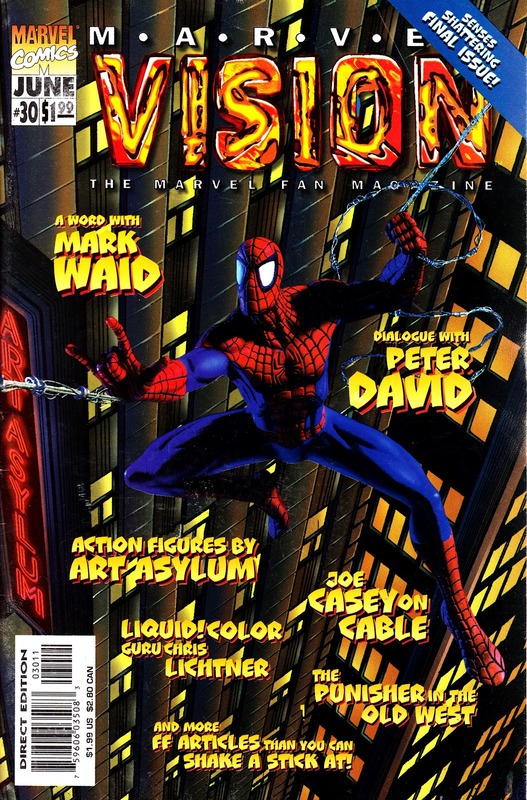 This issue (cover-dated June 1998) was the last.